Michigan Radio’s Jack Lessenberry has a few predictions about Detroit’s plan of adjustment, expected to be filed in bankruptcy court this week. On “This Week in Michigan Politics,” Lessenberry and Christina Shockley discuss potholes, an effort to raise Michigan’s minimum wage and the upcoming trial challenging marriage equality in the state as well as the city’s plan of adjustment. Michigan Public Radio Capitol Bureau Chief Rick Pluta talked to Gov. Rick Snyder about his budget proposal for the 2014-2015 year. The governor wants the Legislature to approve $17.5 million a year (for 20 years) for Detroit. “Why is that a good investment,” Pluta asked. Hear what the governor said. In addition, Pluta chatted with WDET’s Craig Fahle about the governor’s budget priorities in the coming fiscal year. Detroit’s filing for – and future emergence from – municipal bankruptcy is being watched from around the world. Everyone has an opinion about its need, whether pensions should be protected, what other cost-cutting measures other cash-strapped municipalities should take (like privatization of services, selling assets, slashing salaries…) and what, if anything, Detroit’s fiscal health means to the rest of Michigan. Listen to Michigan Radio’s report that explores the findings of the University of Michigan’s Center for Local, State and Urban Policy survey of local leaders throughout the state. 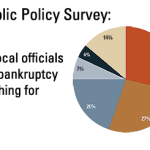 Despite party affiliation, the administrators are generally supportive of Detroit’s bankruptcy filing and also offer ideas about what fiscal strategies municipalities should pursue in the interest of responsible financial management. But they have concerns…especially when the issue of state assistance is raised. We also have the full report for you to examine. Michigan Radio reports: To successfully emerge from bankruptcy, Detroit has to find ways to cut spending and increase revenue. But, that’s not going to be easy when so many Detroit residents are struggling just to get by.